Ling, Z., Ji, Z., Ding, D., Cao, J., and Xu, F. (2016). 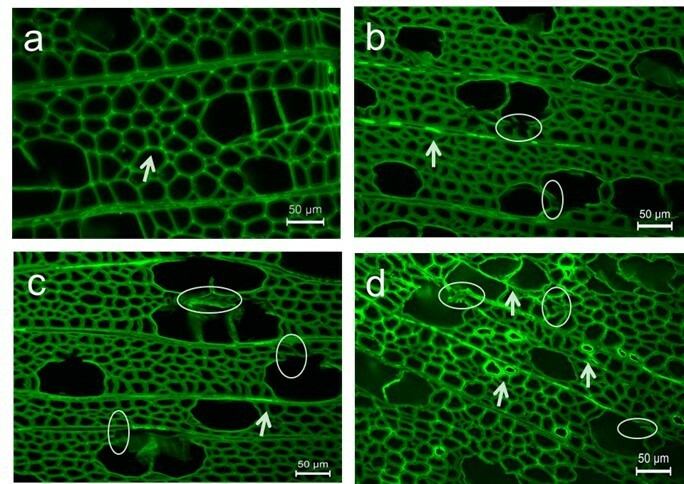 "Microstructural and topochemical characterization of thermally modified poplar (Populus cathayaha) cell wall," BioRes. 11(1), 786-799. Although many studies have been conducted on the wood property and chemical changes caused by thermal modification, little has been reported on the microstructural and topochemical changes occurring in the cell wall during heat treatment. In this study, poplar (Populus cathayaha) was treated within a temperature range from 180 to 220 °C for 4 h. Chemical analyses by Fourier transform infrared spectroscopy (FTIR) and nuclear magnetic resonance (NMR) indicated that heat treatment resulted in deacetylation of hemicelluloses and cleavage of lignin chains, thus generating new carbonyl and phenolic linkages. Transformation of matrix substances contributed to microstructural changes that appeared in clearly distorted and collapsed fiber and vessel walls along with the delamination of compound middle lamella (CML) and secondary walls (S), which showed a reduced capability to resist deformation. It was also observed by fluorescence microscopy (FM) and scanning electron microscope coupled with energy dispersive X-ray analysis (SEM-EDXA) that the concentration of lignin increased, probably because of the degradation of hemicelluloses and the generation of new carbonyl groups. These results on cell wall microstructure and topochemistry can help explain the altered wood properties revealed by dynamic mechanical analysis (DMA) and equilibrium moisture content (EMC) testing after heat treatment. Wood modification can enhance quality and extend service life by changing properties via heat or chemical modification. Compared to chemical treatment, heat treatment can improve biological resistance (durability) of wood without using additional chemicals; thus, this eco-friendly technique has been used widely in recent years (Hakkou et al. 2006). One of the extensively used processes for heat treatment is called ‘Thermowood,’ invented in Finland (Viitaniemi et al. 1997). For this process, raw materials should be set in a humid atmosphere at 150 to 240 °C for 0.5 to 4 h, which varies for different wood species. One of the advantages of ‘Thermowood’ treatment lies in the reduction of treatment duration without much deterioration of wood quality, which can effectively save energy and improve the productivity of materials (Poncsak et al. 2010). Favorable changes in the physical properties of heat-treated wood (HTW) have been reported, including increased dimensional stability, improved biological durability, reduced equilibrium moisture content, enhanced weather resistance, better thermal insulation properties, and stronger decay resistance (Gunduz et al. 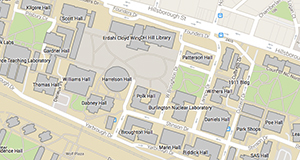 2008; Dilik and Hiziroglu 2012; Hill et al. 2012). The decrease in equilibrium moisture content, which can damage the living environment for fungi and saprophytes, is considered the most significant change during heat treatment. Studies on decreased equilibrium moisture in different wood species and humidity conditions have concluded that higher humidity contributes to a greater reduction of equilibrium moisture, which is more evident for beech wood than spruce wood (Kamdem et al. 2002). Improvement of dimensional stability after heat treatment was first reported by Burmester (1973), who found reduced deformation at optimal pressure and temperature. Such enhanced dimensional stability is desirable for better utilization of wood products. However, some detrimental effects have also been revealed in previous studies (Bakar et al. 2013). Decreased mechanical properties such as hardness and tension strength were determined for samples exposed at 180 °C for 10 h (Korkut and Hiziroglu 2009; Kocaefe et al. 2010). Therefore, the improved dimensional stability has to be balanced against the overall strength values when applying heat treatment for wood applications (Kasemsiri et al. 2012). During thermal treatment, changes in both chemical composition and wood microstructure occur simultaneously (Biziks et al. 2013). Chemical changes are considered to be the main reasons for the improved wood properties in which cell wall compounds and extractives are degraded with rising temperature (Esteves and Pereira 2008). Deacetylation of hemicelluloses, which are sensitive to heat treatment, releases acetic acid, which can act as a further catalyst for polysaccharide degradation (Tjeerdsma et al. 1998; Windeisen et al. 2007; Herrera et al. 2014). Organic acids and furfural liberated from hemicelluloses by hydrothermal processing can participate in the condensation reaction of lignin, leading to increased lignin content, especially acid-soluble lignin (Garrote et al. 1999; Nuopponen et al. 2005). Cellulose, with higher heat resistance, shows little change during the treatment, except for a probable increase in crystalline index (Sivonen et al. 2002; Andersson et al. 2005; Yun et al. 2015). Morphological exploration of thermal modification has not been systematically reported. Studies of heat-treated softwood and hardwood both showed broken morphological structures at high temperatures (Biziks et al. 2013; Boonstra and Tjeerdsma 2006). It has also been reported that the reduced mechanical properties of wood during hydrothermal treatment result from broken or weakened association of hemicelluloses and lignin in cellulose microfibrils (CMFs) (Abe and Yamamoto 2006). Previous studies have focused on the improved properties of HTW, virtually all explained by chemical changes. However, there is limited literature about microstructural or topochemical changes and their impact on properties of HTW during treatment. In this study, poplar (Populus cathayaha), which has been widely utilized in the wood industry, was adopted for ‘Thermowood’ treatment. Combined with chemical analysis, fluorescence microscopy (FM) and a scanning electron microscope (SEM) were applied to observe the changes in microstructure and topochemistry of HTW. Relationships between topochemistry and various hydroscopic and mechanical properties of HTW were aimed to be identified. Analyses of cell wall structure and chemical composition may help better comprehend the inner reasons for improved wood properties after thermal modification. Poplar (Populus cathayaha) sapwood was cut into 200 × 120 × 25 mm3 (R × T × L) blocks from commercially produced flat sawn lumber supplied by a local sawmill in Yanqing, Beijing, China. The ‘Thermowood’ technology provided by VTT (Technical Research Center of Finland), where an industrial-scale heat-treatment process has been developed, was used for the thermal modification (Viitaniemi et al. 1997). In the first step, specimens were kiln-dried on an industrial scale，followed by an adjustment of moisture content to the range 11% to 16% constantly at 20 °C. The relatively high moisture content of wood contributes to the increased reactivity of cell wall components (Mahnert et al. 2013). Afterwards, samples were treated in steam with air concentration between 3% and 5%. The temperature increase was controlled at 20 °C/h to prevent possible deformation of the samples. Treating temperature and time were set at 180, 200, and 220 °C for 4 h.
The determination of structural carbohydrates and lignin in heat-treated poplar wood was estimated according to the National Renewable Energy Laboratory of the U.S. (NREL) analytical methods for biomass (Sluiter et al. 2005). All wood samples were ground into powder. The sugar content was determined after a two-step acid hydrolysis procedure. The samples were treated with 72% (w/w) H2SO4 at 30 °C for 1 h in the first step. The reaction mixture was then diluted to 4% (w/w) H2SO4 and autoclaved at 121 °C for 1 h. The hydrolysis solution was filtered and analyzed for sugar content by a high-performance liquid chromatography (HPLC) system (Agilent 1200 series, Agilent Technologies, USA) and for acid-soluble lignin (ASL) from absorbance at 240 nm by a UV-visible spectrophotometer (UV2310 II, Tian Mei Scientific instrument Ltd., Shanghai, China). The remaining solid residue was dried overnight at 105 °C. The weight of ash was recorded and used to calculate the content of acid-insoluble lignin (AIL). The effects of heat treatment on the chemical compositions of both carbohydrates and lignin were studied using FTIR spectroscopy. The air-dried specimens were placed in a Thermo Scientific Nicolet iN10 Fourier transform infrared spectrometer (USA). The IR spectra were recorded in the wave number range of 700 to 4000 cm-1 at 4 cm-1 resolution for 20 scans prior to the Fourier transformation. All peak intensities were recorded and analyzed by FTIR software. Nuclear magnetic resonance measurements were conducted by a 13C CP/MAS NMR spectrometer (Bruker AVANCE-III HD 400 MHz, Germany) operating at 100.6 MHz. All samples were smashed with a grinder to dried powder and put in a 5-mL centrifuge tube before being sent to NMR measurements. The chemical shifts were determined in CPMAS (Cross-polarization magic angle spinning) spectra using the cellulose C-1 signal as an internal standard (δ105 ppm). Small wood blocks were respectively cut by slide microtomes into 10-µm transverse sections and 20-µm tangential sections. The specimens were washed in deionized water and then air-dried at room temperature. The samples were scanned using a scanning electron microscope (Hitachi S-3400N, Japan) with a 20-kV accelerating voltage which was also used for Mn-K X-ray spot analysis (EDXA). All specimens were stained with potassium permanganate (KMnO4) to show the lignin concentrations in distinct morphological areas. To investigate morphology and topochemistry of heat-treated samples via fluorescence microscopy, transverse sections cut at 10-µm thickness were examined and photographed with a microscope (Leica DM2000, Germany). where W0 is the dry mass prior to heat treatment and W1 is the weight of oven-dry HTW samples (g). where W2 is the constant weight of the samples at set humidity conditions (g). The heat-treated specimens were prepared with a size of 80 × 10 × 3 mm3 (R × T × L). The dynamic mechanical properties were determined with a dynamic mechanical analyzer (Netzsch-242c, Germany) in three-point bending mode. The temperature ranged from -100 to 300 °C, and the frequency was maintained at 10 Hz. The equilibration time was 10 min, and the heating rate was set at 3 °C/ min. The composition of poplar before and after heat treatment is given in Table 1. For untreated samples, hemicelluloses presented a relatively high content of 29.30%. With rising temperature, xylose, which made up 15.56% of hemicelluloses, showed a marked decrease, to 9.17% at 220 °C, demonstrating a heavy degradation of hemicelluloses (29.90%), corresponding to previous studies on degradation reactions of hemicelluloses with heat treatment (Alén et al. 2002; Poncsák et al. 2006). No obvious changes were observed in arabinose, galactose, and mannose because of their high stability (Table 1) (Alén et al. 2002; Radlein et al. 1991). However, a minor increase in glucose, at 48.01% (180 °C) and 48.51% (200 °C) over that of raw materials (46.53%) was revealed, which may have contributed to a slight increase in the crystallinity of HTW (Dwianto et al. 1996; Bhuiyan et al. 2000). The AIL content of untreated samples was relatively low, 18.91% (Table 1). However, a remarkable increase in AIL content was revealed at 220 °C (23.35%); ASL content also displayed a mild increase, from 0.35% (untreated) to 0.42% (220 °C). The overall alterations coincided with previous studies indicating that higher treatment temperature plays an important role in changing the chemical composition of wood, resulting in reduced mechanical properties and increased durability of HTW (Kamdem et al. 2002; Poncsák et al. 2006). More detailed studies of chemical groups were carried out using FTIR and NMR. 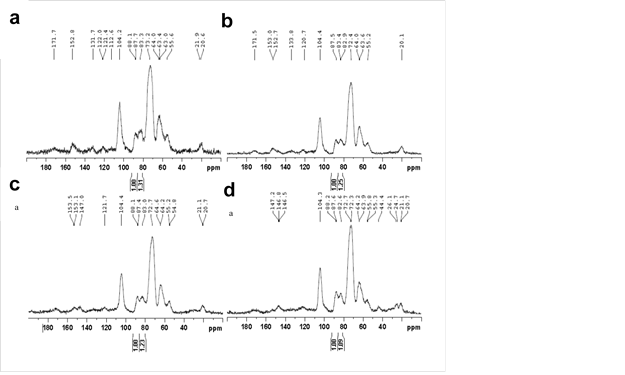 The FTIR spectra of poplar samples before and after treatments are shown in Fig. 1. The band at 3406 cm-1 corresponding to the O-H stretching vibrations in carbohydrates conspicuously decreased with increasing temperature, which suggested degradation of hydroxyl groups in hemicelluloses during treatment (Kondo 1997; Tjeerdsma et al. 1998; Weil and Guyonnet 2003; Rautkari et al. 2013). As temperature increased, the bands at 1740 cm-1 and 1245 cm-1, assigned to skeletal vibrations of carbonyl and cleavage or alterations of carboxylic groups (mostly acetyl groups in hardwoods) both decreased, which was further confirmed by the diminished band at 1650 cm-1, known for hydroxyls in aliphatic groups. The loss of hydroxyls decreased the water absorption ability of cell walls, thereby decreasing the EMC of wood after heat treatment (Jämsä and Viitaniemi 2001). Figure 2 demonstrated evident reduction of EMC from 7.83% (untreated) to 4.14% (220 °C), confirming that degradation of hydroxyl groups was the primary reason for the decreased EMC. With heavily degraded hemicelluloses, as determined in chemical and FT-IR analyses, the increased ML in Fig. 2 was likely caused by acetic acids from acetyl radicals, formic acids from carboxylic groups, and furfural from the dehydration of xyloses (Bourgois and Guyonnet 1988). The decline in bands at 1600 cm-1 and 1516 cm-1, assigned to skeletal vibrations of aromatic rings, and 2850 cm-1, corresponding to stretching vibrations of C-H in aldehyde groups, implies a split in aliphatic chains and aromatic groups of lignin during heat treatment. On the contrary, the 1096 cm-1 band assigned to C-O increased with elevated treatment severity, which suggests generation of phenolics resulting from a split in β-O-4 ether linkages (Nuopponen et al. 2005; Tjeerdsma and Militz 2005). Solid 13C CPMAS NMR spectroscopy was applied to provide important diagnostic information on the chemical composition of heat-treated samples because of its well-resolved signals from various structural environments in a complex molecule. As shown in Fig. 3, the diminished shoulder at 102 ppm, which is assigned to C-1 of hemicellulosic carbohydrates, indicates depolymerization of hemicelluloses of heat-treated samples (Wikberg and Liisamaunu 2004). In terms of lignin, the demethoxylation reaction was indicated by the reduction of the signal at 55 ppm, assigned to methoxyls of aromatic rings, and 153 ppm, assigned to etherified carbon in syringyl (S) units (Haw et al. 1984; Hawkes et al. 1993). Together with the increased intensity of the signal at 147 ppm, assigned to C-3,5 in non-etherified syringyl (S) units and C-3 in guaiacyl (G), it can be concluded that the β-O-4 linkage of both S and G lignin cleaved, generating new phenolic hydroxyl linkages after heat treatment. The overall structural changes match with the FTIR analysis and may contribute to some wood properties (Tjeerdsma et al. 1998). The CPMAS NMR spectroscopy can also be used to measure the crystallinity of cellulose by calculating the ratio of the signals at 89 and 84 ppm, respectively assigned to C-4 carbons of ordered and disordered cellulose (Horii et al. 1982; Newman et al. 1993). A higher proportion of crystalline cellulose in thermally modified samples was revealed by the change in the ratio from 1:1.31 to 1:1.25, 1:1.23, and 1:1.09 (Fig. 3), showing a higher crystallinity for HTW. The increased cellulose crystallinity and polycondensation reactions of lignin after heat treatment revealed in NMR analysis also contributed to the inaccessibility of hydroxyl groups to water molecules. The altered wood properties were further studied via DMA. Results for the storage modulus (E’) and the loss factor (tan δ) of HTW are presented in Fig. 4. E’ is defined to represent the capacity of specimens to store mechanical energy and to resist deformation, and tan δ is the ratio of the loss modulus (E’’) to E’, as well as the ratio of dissipated energy to stored energy. 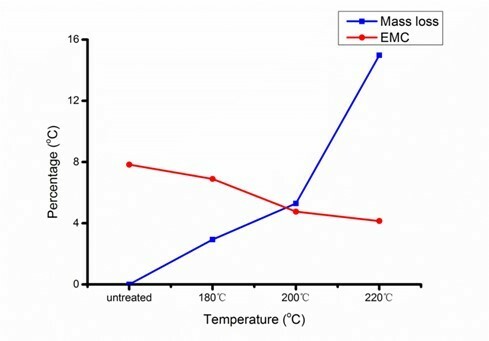 Compared to raw materials, samples treated at 180 and 200 °C showed much lower E’ values, which may be attributed to the deterioration of inter- and intramolecular chemical bonds with rising temperature and loss of amorphous hemicellulosic polysaccharides (Jiang et al. 2009). Moreover, intense tan δ peaks appeared with rising temperature, suggesting more dissipated energy and lower mechanical properties. Figure 5a-d shows SEM images of transverse sections of poplar samples during heat treatment, clearly certifying that heat treatment contributed to microstructural damage to the samples. Untreated samples consisted of compact fibers, vessels, and ray cells, which ensure the mechanical properties of poplar wood (Fig. 5a). With rising temperature, separation of the S layer and CML, as well as collapse of the vessels, was revealed (arrows in Fig. 5b, c), and delamination within fibers was more pronounced at an elevated temperature (220 °C) (arrows in Fig. 5d), which may be attributed to heavy degradation of hemicelluloses as adhesives between sublayers. It can be concluded that, despite the molecular reactions investigated via chemical analyses, the deconstruction of matrix substances was responsible for the attenuation of the mechanical properties of modified wood, as revealed by DMA (Girones et al. 2007). Comparing different cell types of heat-treated poplar, vessels seemed to be more resistant to deformation than fibers. This may result from the fact that more G units of lignin contained in vessel walls supported higher stability in response to mechanical stress than S units, which are abundant in fiber walls. However, the capability of vessels and fiber walls to resist deformation became vague at 220 °C as a result of cleavage of β-O-4 ether linkages existing in both G and S units, as concluded from NMR analysis (Fig. 5d), which deeply confirmed the decreasing capacity to resist mechanical deformation. By calculating the thickness of fiber walls, it was found that fiber walls thickened, accompanied by shrunken cell lumens, during heat treatment (Fig. 5, Table 2). One possible explanation is that the degradation of hemicelluloses and lignin weakened the connection of CMFs and matrix substances, which has been shown to expand CMFs transversely (Abe and Yamamoto 2006). Another reason could be that the decreasing amorphous proportion left pores in cell walls, diminishing the order in the arrangement of CMFs and increasing the average thickness of cellulose crystallites (Andersson et al. 2005). Additional information on microstructural changes can be seen from the SEM micrographs of tangential sections of poplar samples (Fig. 5e-h). Untreated samples presented regularly arrayed vessels, rays, and fiber walls as well as intact pit structures (circles in Fig. 5e). When the temperature reached 180 °C, fibers and vessel walls were slightly distorted and cracked (circles in Fig. 5f). More severe damage to fibers occurred at 200 and 220 °C; small fractions were delaminated from fiber walls, probably caused by the modification of polysaccharides and lignin (arrows and circles in Fig. 5g, h). Distinct deformation of and damage to the microstructure in tangential sections indicated weakened mechanical properties of poplar samples after heat treatment, which may limit the utilization of HTW. FM revealed the morphological structure of samples as well as qualitative information about the lignin distribution in morphological regions because of the existence of lignin auto-fluorescence (Ricci and Nesta 1976). Fiber and vessel walls were thickened and distorted with rising temperature, which is consistent with microstructural results determined by SEM (circles in Fig. 6b, c). Similar to previous studies (Ji et al. 2013), cell corners (CCs) fluoresced more brightly than adjacent CML, and the weakest intensity was present in the S layer, with relatively low lignification. After heat treatment, a higher concentration of lignin was distinctly observed in each morphological region, while trends of lignin distribution remained invariant (arrows in Fig. 6). It is noteworthy that even though the lignin concentration of CCs was still the highest among the various layers at each condition, a remarkable increase in fluorescence intensity in the S layer, especially at 220 °C, took place, which displayed its rapidly enhanced lignin concentration (arrows in Fig. 6c, d). To specifically measure the uneven distribution of lignin in different morphological regions, scanning electron microscopy coupled with energy dispersive X-ray analysis (SEM-EDXA) was applied to the heat-treated samples. Potassium permanganate (KMnO4), which reacts with the double bonds in lignin molecules, was used as a lignin stain to localize lignin distribution. Figure 7a shows the X-ray counts of Mn-K for various fiber wall layers of heat-treated poplar, from which the ratio of lignin concentration in various morphological regions can be estimated by the elemental Mn content. For the raw material, the calculated elemental Mn concentrations in the CC, CML, and S layers were 26.43%, 22.67%, and 21.45%, respectively. Thus, the lignin concentration ratio of CC:CML:S was 1.23:1.05:1. A decrease in the ratio, i.e., 1.09:1.08:1, appeared at 220 °C, suggesting a remarkable increase in lignin concentration in the S layer, which confirmed the qualitative results obtained from FM analysis. The X-ray counts of Mn-K for vessel wall layers were also analyzed and presented a similar trend as the fibers (Fig. 7b). With commonly higher Mn contents in each layer than fiber walls, CCs of vessel walls still had the highest lignin concentration, followed by CML and S layers. The ratio of CC:CML:S was reduced from 1.30:1.17:1 (untreated) to 1.22:1.13:1 at 220 °C. With the highest thickness among the layers, the S layer contains more lignin than CC and CML (Xu et al. 2006). Polycondensation reactions of lignin took place, generating carbonyl groups for further cross-linking in the lignin network, which contributed to the rapid increase in lignin in the S layer (Dietrichs et al. 1978). As a result, a higher lignin concentration was responsible for decreased EMC and improved durability and dimensional stability of HTW (Tjeerdsma and Militz 2005). Variations in the substance matrix derived from hemicelluloses and lignin contributed to clearly distorted and collapsed fiber and vessel walls, along with the delamination of CML and S layers, which proved the reduction of mechanical properties. Lignin concentration increased in various morphological regions because of the degradation of hemicelluloses as well as condensation reactions of lignin. Such enhancement appeared more noticeably in the S layer because of its highest thickness, containing more lignin in this area. Remarkably reduced equilibrium moisture content and mechanical properties were revealed with rising temperature. The hydrophobicity and mass loss of HTW resulted from deacetylation of hemicelluloses and cleavage of lignin chains, generating new carbonyl and phenolic linkages. The present study provides new insights to explain the transformed properties of HTW. Some improved wood properties which are required to be balanced with reduced mechanical performance are systematically testified with a series of microstructural and topochemical analyses. For effective utilization, more concentration should be focused on the influence of treatment temperature, which resulted in compositional and structural degradation to different extents, thus making it possible to control the property variation and to inspire higher potential of wood modification. The authors gratefully acknowledge the financial support from the National Natural Science Foundation of China (31225005, 31170557) and the Chinese Ministry of Education (113014A). Dwianto, W., Tanaka, F., Inoue, M., and Norimoto, M. (1996). “Crystallinity changes of wood by heat or steam treatment,” Wood Research Inst., Kyoto Univ. 83(9), 47-49. Jämsä, S., and Viitaniemi, P. (2001). “Heat treatment of wood – Better durability without chemicals,” Proceedings of special seminar held in Antibes, France. Sluiter, A., Ruiz, R., Scarlata, C., Sluiter, J., and Templeton, D. (2005). “Determination of extractives in biomass,” Laboratory Analytical Procedure (LAP) 1617, National Renewable Energy Laboratory, Golden, CO.
Viitaniemi, P., Jamsa, S., Ek, P., and Viitanen, H. (1997). “Method for improving biodegradation resistance and dimensional stability of cellulosic products,” Google Patent 5,678,324,24. Article submitted: September 8, 2015; Peer review completed: October 24, 2015; Revised version received: November 1, 2015; Accepted: November 8, 2015; Published: November 25, 2015.